FILIPINO boxing trainer Joven “JJ” Jorda is now training Thailand’s Anurak “Nop Kratingdaenggym” Thisa, who will be challenging WBA World super bantamweight champion Nehomar Andrés Cermeño of Venezuela on September 30 in Wenzhou, China. The 43-year old Jorda has been preparing Thisa since August in Bangkok, Thailand. The 25-year old Thisa is undefeated with 17 straight wins with five knockouts. He has defended his PABA super bantamweight title 10 times already. In his last two fights, which were both title-defenses, Thisa stopped Filipino Junar Adante (4th round) and Indonesian Waldo Sabu (6th round) early this year. Jorda has already produced or trained 12 world, international and Philippine champions. They are IBO world light flyweight and PABA light flyweight champion Rey “Singwangcha/Hitman” Loreto of Davao City, Oriental Pacific Boxing Federation (OPBF) welterweight champion Taisei Marumoto of Japan, WBC International flyweight champion Rey “Delubyo” Megrino of Lopez Jaena, WBC Asia light flyweight champion Jay-Ar “The Smasher” Estremos of Davao City, WBC Asia featherweight and Luzproba featherweight champion Ranel “Tirador” Suco of Pagadian City, WBC Asia lightweight and IBF Pan Pacific light weight champion Tosho Makoto Aoki of Osaka, PBF lightweight champion Takaya “The Samurai” Kakutani of Osaka, WBC ABCO featherweight and Philippine Boxing Federation featherweight champion Alvin “Cold-blooded Assassin” Tam of Benguet, WPBC International lightweight, WBO Asia Pacific Youth super featherweight and OPBF super featherweight champion Allan Tanada of Cebu, WBC International bantamweight and WBC Asian Boxing Council super bantamweight champion Rex “Igorot Warrior” Wao of Benguet, WIBA International light flyweight champion Jujeath “Bad Girl” Nagoawa of Benguet and recently WBC Eurasia Pacific Boxing Council welterweight and WBC Youth world super lightweight champion Sonny “Pinoy Hearns” Katiandagho of General Santos City. Meanwhile, the 36-year old Cermeño is also a former WBA Fedebol featherweight champion, interim WBA World super bantamweight champion and WBA Fedelatin super bantamweight champion. 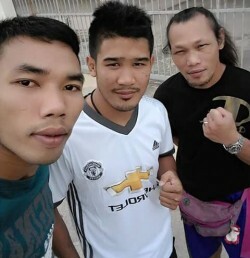 Photo: Filipino boxing trainer Joven Jorda (extreme right) with Thailand's Anurak “Nop Kratingdaenggym” Thisa (center), who will be challenging WBA World super bantamweight champion Nehomar Andrés Cermeño of Venezuela on September 30 in Wenzhou, China.